"It's good debt. It's secured, you've got an asset and it's growing," said Ruth Berry, a family social sciences professor at the University of Manitoba. Rising Inflation In Edmonton- "What you've got is an influx of people coming into Edmonton. In the short run, there will be a shortage of housing, which will drive up prices. When you are talking about the short run in the Edmonton real estate market we think in terms of 5 to 7 years. The oil sands have 200 years worth of oil in them but it doesn't take that long to make a profit in this market. Dodge warns of inflated housing market-"One worries about the structure of the mortgage market, that we may be actually aiding, facilitating a rise in the price of houses that is really not warranted.."
Mr. Dodge warned that housing prices outside of the fast-growing cities of Western Canada may be rising too quickly. "A government-appointed panel reviewing Alberta's energy royalties called Tuesday for the oil-rich Canadian province to increase its total take from the energy industry by 20 percent a year, or roughly $2 billion Canadian (US $1.97 billion; €1.42 billion)." How will this affect the Albertan Economy? 1. Albertan will see more more of the Oil Sands revenue in infrastructure and perhaps more rebate cheques. 2. Oil companies worry that rising royalties may slow or hinder production. With the oil prices rising and Alberta's 175 Billion barrels of oil, second only to Saudi Arabia, many companies will pay the royalties to participate in what may be the biggest economic boom of the century. This is a really sad article that I came across from CTV.com. A business man and father of three was slain for a mortgage that fell through. "Two men accused of orchestrating and carrying out the murder of successful Calgary businessman Jack Beauchamp appeared in court on Monday. Friends and family of Beauchamp, a 49-year-old father of three and former president of commercial mortgage lending company Morbank Financial, crowded the Court of Queen's Bench in Calgary for the start of a trial that is expected to last four weeks. Beauchamp was found fatally shot in the head and chest on Jan. 16, 2006, surrounded by shell casings in the hallway of the 12th floor offices of the firm he founded. Robert Deer, 54, and Mohammed Karim, 25, are charged with first degree murder. Calling it a planned and deliberate crime, Crown prosecutors Sue Kendall and Pamela McCluskey told the court that the accused plotted the murder after a real estate deal went sour. Kendall told the court that Deer planned to develop houses on Westmount Road in the trendy Calgary neighbourhood of Kensington, and arranged a $1-million mortgage with Beauchamp's company. When the mortgage deal fell through, she said Deer began an angry email exchange with Beauchamp. Kendall said she intends to prove to the court that Karim pulled the trigger, and that he was acting on Deer's behalf." YES - housing prices have slipped in Alberta, but is it really the big drop that everyone fears? "August's (nationwide) decline was due largely to drops in Alberta, where the average price in Calgary fell $13,000 to $423,801 and Edmonton's average slipped $8,100 to $345,809." NO - what we are seeing is a slight softening of the market. After such a meteoric rise in housing prices over the last 18 months we need a correction. Don't forget Alberta's economics are undoubtedly the best in Canada. B.C. Housing "Afford ability" Drops - "While Vancouver remains the country's most expensive real estate market, the largest affordability slides over the last couple of years have been suffered by Saskatoon, Edmonton and Calgary. Although housing affordability in Alberta has dropped over the last year housing is still more affordable than many Canadian cities. housing market scaled back from where it was 14 months ago." The market is scaling down, and that is what happens with incredibly hot markets. This softening will last about 6 months. We consider it a great time to pick up good deals that will appreciate. Housing Highs Still Showing - "Real estate is driven by monthly payments and you can afford more and pay less monthly when your amortization is moved from 25 years to 40 years." If you can buy more "house" at cheaper monthly payments then the cost of housing isn't such a problem for buyers. Alberta has good odds to avoid post boom bust - "With the province expected to post economic growth of 4.3 per cent this year, growth is expected to moderate to between 2.5 and three per cent for 2008-09 due to rising costs for labour, production and infrastructure. 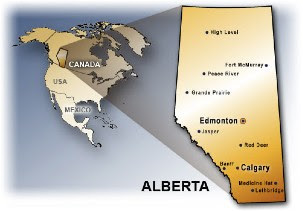 ""The promise of oilsands projects, combined with assets such as a young, educated population and an excellent business climate, bodes well for the region,"
Alberta has a strong economic future. Could The U.S Housing Market Crisis Happen Up North? "Here at home(Canada), only about 5% of mortgages are of the sub prime variety (I prefer the more explanatory, "sub credit-worthy"). Experts insist the crisis is simply not as great a threat to Canada. But it's still a threat. Canadian high-ratio mortgages - loans where the purchaser has only made a down- payment of 20% or less of the purchase price - have to be insured for default by the government-backed Canada Mortgage and Housing Corp. or one of the private companies that perform this service. The insurance covers the lenders' losses, not the borrowers', which, to say the least, is an important distinction. Using that backup, some lenders, even the big banks, approve mortgages with zero down. In addition, an alarming number of folks almost routinely increase the value of those loans in lockstep with the increasing price of their properties. Instead of basing the maximum loan value on a borrowers' ability to repay, there seems to be a tendency toward using the appraised value of the real estate. It's the same tactic haunting U.S. lenders today. "Many people think that somehow Canada is immune to all of this ... but the likelihood is they're wrong, writes the Tory turned Liberal MP, who appears hellbent on bringing down Prime Minister Stephen Harper. He warns that Canadians have never had as much of their net worth in real estate "more than 80%, on average," which makes them undiversified and prone to the kind of misery that has hit American homeowners. "Alberta's minimum wage rose from $7 to $8 this Labour Day long weekend. The raise brings Alberta in line with the provinces of British Columbia, Ontario, Quebec and Manitoba, which all have $8 minimums. The Northwest Territories, Yukon and Nunavut all have slightly higher minimum wages. I don't think this will have much of an impact as less than 1.7% of wage earners in Alberta are earning minimum wage. I hear countless stories of fast food restaurants trawling the teenage customers offering incredible salaries because there just isn't anybody to do the work. Success is dealing with change, both positive and negative. The Donald Trump story is one of the most amazing stories of financial roller coaster rides there is. He went from real estate billionaire, to being close to $900 million dollars in debt, back to billionaire in a relatively short period of time. Success is making your own mark, regardless of your upbringing. Donald was raised in a well-to-do family and had many opportunities and advantages in his youth. Despite his privileged upbringing, he did not inherit anything and went on to fame and fortune through his own business accomplishments. Success is making the right connections. When Donald first moved to Manhattan, he was practically broke. Regardless, he squandered what money he did have to join one of the city's most exclusive clubs and met some very influential people. Success is having an attractive personality. Donald Trump is funny, smart and honest. He is a very likeable person who knows the value of honest admiration. Success is handling pressure. In 1991 when Trump was about $900 million in debt, it was his ability to deal with pressure that allowed him to stay in the game and eventually pull off one of the largest financial comebacks in history. Success is self-promotion. Donald Trump is a very public figure who uses his popularity to fuel his success. He has appeared in dozens of movies, commercials and TV shows and currently stars in a reality-based TV series. It is reported that 98% of Americans surveyed know who Donald Trump is. Success is doing great things for others. There is a story about an unemployed mechanic who once helped Donald Trump get his limo working again after it stalled on the highway. The mechanic did not accept anything for his services besides a "thank you". Trump was so impressed with the mechanic's generosity that the next day he sent flowers to the man's wife, and a letter certifying that the man's mortgage had been paid off in full. Donald Trump (1946 -) is a real estate billionaire, best-selling author and executive producer of The Apprentice TV show. Although the price of Edmonton Real Estate has increased by almost 77% over the last 18 months, young families are still able to afford housing IF they buy in older areas. Alberta Ave know for being, tough, crime ridden and cheap is where young families are forced to buy when they $170,000 doesn't fit into the new $417,000 price tag that most housing in Edmonton sports. Eric Feddes and Krista Polley of Edmonton decided that extreme renovations in the rough neighborhood was the way to go. "A realtor took them to a rickety two-storey house with boarded-up windows, no bathroom and the lingering smell of human waste. Needles were scattered all over the basement floor and there were remnants of a grow-op. The place had one big advantage, though - they could afford it. "We knew we could fix it up, but we didn't think it would be easy," says Feddes. They got to work - new furnace, plumbing, wiring, windows, doors, bathrooms, walls and paint. As they walked nearby streets, they saw the scene repeated as other young couples settled in." They work and an incredible market worked in increasing the value of their property by over $100,000. It goes to show that when you can think outside of the box, don't mind using elbow grease and are willing to invest in the hottest market in North America you can get big payoffs. Calgary's high end sales lead to a blockbuster year with the capital city selling 326 properties at a value of over $18Billion by July in 2007. The Alberta market is incredibly active and constantly breaking records. The sale of high end properties of over $1 million reached 326 by the end of July. The prices of houses in the Calgary area rose from $398,870 in December 2006 to $505,920 buy July'07. As it is often said Edmonton's market closely follows Calgary's and it isn't hard to believe that we will be seeing prices like this in Edmonton next year.